Could Afonso Dhlakama's Brother Take Over Renamo Leadership? 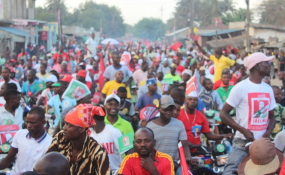 Mozambique ruling party Frelimo supporters. Maputo — The Mozambican government on Wednesday defended the behaviour of the police during the 10 October municipal elections, against claims by the former rebel movement Renamo that the police had facilitated fraud and "theft of votes" by the ruling Frelimo Party. In a question and answer session in the Mozambican parliament, the Assembly of the Republic, Renamo demanded an explanation for the "savage treatment" meted out by the police to Renamo members and supporters, including shootings and arbitrary detentions. But Prime Minister Carlos Agostinho do Rosario praised the police for their actions claiming that these were "determinant for preventing and containing acts of violence in the pre and post-electoral periods". Justice Minister Joaquim Verissimo said that the police had acted in a non-partisan manner and had even intervened to rescue Renamo delegates in Manica and Cabo Delgado provinces who had been abducted and almost lynched by other Renamo members who accused them of "selling our votes" to Frelimo. Renamo deputies, however, claimed that the elections had been fraudulent, because the National Elections Commission (CNE), its executive body, the Electoral Administration Technical Secretariat (STAE), and the police had all worked to defraud Renamo of victory. "People voted massively for Renamo and the CNE and STAE diverted the votes", declared one deputy. He and his colleagues thus forgot that there are Renamo appointees at all levels of STAE, and on all the election commissions, including the CNE. The deputies seemed unaware that the CNE had unanimously, including its Renamo members, approved the results in 48 of the 53 municipalities. On the CNE, Renamo only contested the Frelimo victories in five cities and towns - Matola, Marromeu, Alto Molocue, Monapo and Moatize. There is indeed strong evidence of serious irregularities and fraud in those five municipalities. But in the Assembly debate Renamo made much wilder allegations - including a claim, recycled by Renamo at every election, that people not entitled to vote had been bussed into the municipalities in large numbers to vote for Frelimo. No proof has ever been offered for this, and nobody has ever seen fleets of buses ferrying voters round the country. Absurdly, one Renamo deputy, Mario Ali, claimed that these people ineligible to vote had been ferried in to the northern city of Nampula. Yet, far from a Frelimo victory, Nampula was Renamo's greatest triumph where it took almost 60 per cent of the vote. Ali also made the libellous claim that the spouse of a government member had distributed money to buy votes in Mozambique Island - yet this too was a municipality won by Renamo. Renamo also made sweeping claims such as the police firing tear gas "in all the polling stations", and Carlos Maela alleged that members of the riot police "inundated" the polling stations in Quissico and Massinga, in the southern province of Inhambane. This was the first time there had been any Renamo protest about these small towns. Some Renamo claims were quite impossible - such as the allegation that in a polling station where 300 people were registered, 600 votes were cast for Frelimo. Such a mathematical monstrosity would never get through the STAE computers, which reject results sheets that don't add up. Younusse Amade, the second deputy chairperson of the Assembly threatened divine vengeance against Frelimo. "Although human justice deliberately fails, divine justice will never fail", he declared. Antonio Muchanga, the Renamo deputy who had also been candidate for mayor of Matola, suggested that national reconciliation was at risk. "What reconciliation can there be with people who steal votes? ", he asked. Frelimo deputies retorted that Renamo's claims were just a matter of sour grapes because it had lost. Repeatedly they stressed that, according to the results declared by the CNE, Frelimo had won 44 of the 53 municipalities (although when votes, rather than municipalities, are counted, the result was much closer, with Frelimo winning less than 52 per cent of the vote). Sergio Pantie, a member of the Frelimo Political Commission, said that in reality Renamo had sparked off violence during the elections, and it was Renamo that had falsified results sheets (though he cited no examples). He said that there are still two Renamos - one working within the law in institutions such as parliament, and one still bearing arms, prepared for war, in the bush of the central district of Gorongosa. As for the Renamo denunciations of the police, Frelimo deputy Deolinda Chichomo retorted "All criminals are afraid of the police". Copyright © 2018 Agencia de Informacao de Mocambique. All rights reserved. Distributed by AllAfrica Global Media (allAfrica.com). To contact the copyright holder directly for corrections — or for permission to republish or make other authorized use of this material, click here. South Africa: Judge Says Chang Can Be Extradited to U.S.